huh? it's wednesday already? crap. today has been one of the most productive days of my life. i'm only sort of exaggerating. i have made 15 coffee cuffs, 2 really cute aprons, 2 dozen cupcakes, cayenne pretzel sticks, a honey glazed ham, a peppermint latte (must.keep.going), i'm blogging currently, and i'm about to wrap presents and get this cute little townhome ready for our small group christmas party tonight! so pumped. martha, i may be gaining on you. anywho, let's get to this recipe. one of my favorite memories from the whole wedding process was the kitchen shower that some sweet friends threw in my home town. at this shower, everyone brought a gift for the kitchen (ROBINS EGG BLUE!!!) and a recipe or two. This particular one was given to me by my Aunt Mary (we share the same birthday and i love her lots! really, i have the greatest...and most beautiful...aunts around. try me). I bust it out when i am in desperate need of Tex-Mex. Good Mexican food is something Chase and I are pitifully deprived of here. (I know, cry me a river..) It is paired perfectly with black beans (with cilantro, garlic, and onion), tecate (for Chase..beer is yucky), and maybe a sopapilla cheesecake if Chase is lucky. -cook chicken in oil until done. i typically season mine with garlic salt. -mix together other ingredients except tortillas. -take remaining half of sauce and pour over enchiladas. -bake at 350 for 30! Aunt Mary says: " I just layered the tortillas and sauce & cheese - like lasagna. Who has time to roll it up? " haha love it. seriously, it says that on my recipe. too funny. This usually makes 2 casserole dishes of enchiladas & they make great leftovers. just pop em in the microwave for 30-45 seconds. mmmm. Kim, I love this recipe! My mom makes one almost identical, except I use plain corn doritos. It has definitely become a stand by in my new home! 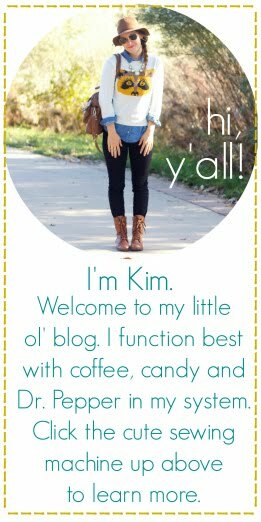 Found your blog and I think it is oh so cute by the way! You are definitely gaining on Martha too!